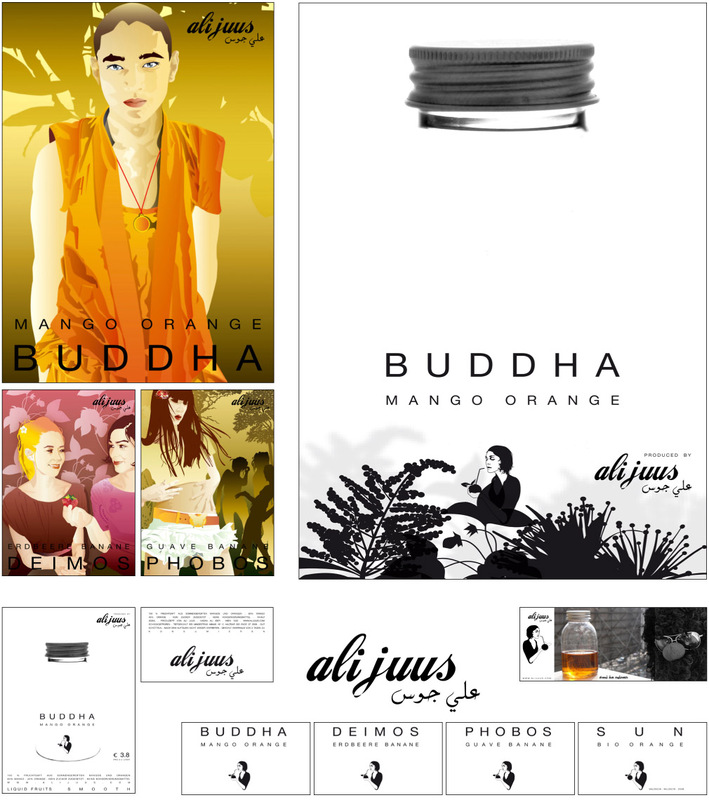 For Ali Juus, a fruit drink seller, we designed the labels and appearance. It was a collaboration. The logo had been designed by denise, the graphics where created by kw, an other graphic designer ‘Ali Juus’ asked to contribute. We put everything together and consulted the client with the design of the bottles. There where product cards produced, table cards, posters, mail outs,... and the bottle labels – that where printed on transparent foil, on a small 0.3ml bottle. The juice is a high quality product – imported frozen, and to be defrosted before usage. Part of the concept was also the naming. Every fruit juice got a name like ‘Ikea’ is doing it. We named them after ancient gods or other mythical figures. Buddha was the name for the mango juice. On the cards and the website was also the story of Buddha, when he was squeezing a mango, putting it into earth and letting it immediately grow – this to prove his power. Deimos and Phobos, the sons of Mars, also moons of Mars, the Sun for orange,... The logo was created by denise, the graphics by K.W..